There are two main criteria. Daily pivots and moving averages. To open a buy order, today's daily pivot must greather than the day before's daily pivots. 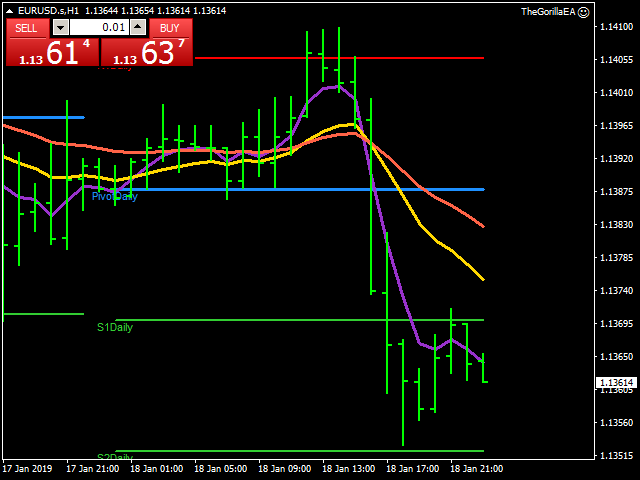 Moving averages for EURUSD pair as default. They can be changed for other pairs and also for EURUSD too. You can also change takeprofit and stoploss level. expert doesnt trade on mondays and before 2 hour on other trade days. You can test and optimize for all pairs with extern parameters. Do not purchase without testing and optimizing for your broker. MagicNum: Expert will use this magic number for your safety. Default is 1. Lots: Expert will open this amount of lot size.Default is 0.01. Stoploss: Stoploss will calculated with this parameter as 5 digits.Default is 300. Takeprofit: Takeprofit will calculated with this parameter as 5 digits.Default is 300. Mov1_per: First Moving Average period. Default is 4. Mov2_per: Second Moving Average period. Default is 15. Mov3_per: Third Moving Average period. Default is 30.